The Miss Multiverse Pageant is the most adventurous, innovative and the only international pageant REALITY TV PROGRAM! G & G Exchange – The leading beauty pageant company in The Netherlands is proud to introduce the world finals of Miss Multiverse pageant and TV reality program. Miss Multiverse 2014 will take place November, 2014 in Punta Cana The Dominican Republic (Exact Dates TBA), for this high class event we will provide our international models with the most luxurious beach resort, the top touristic spots of the Caribbean and the best event and production crew surrounding them, making Miss Multiverse one of the top events in the Beauty pageant World. The Miss Multiverse Reality TV program is broadcasted in large parts of Latin America and the United States – A great opportunity for any model/actress to brand herself. The main objective of the Miss Multiverse pageant is to offer a life changing experience and empowering program. 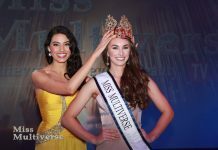 Through the Miss Multiverse journey our delegates will be rewarded with an experience that will last a lifetime and become part of a worldwide network of friends, possibilities, growth and opportunities we call The Miss Multiverse network. Modern women are independent, educated, empowered and much more; THEY ARE MULTIVERSE… multi-faceted, multi-talented, multi-skilled and much more. Debora Lyra (born September 26, 1989) is a Brazilian beauty queen who won the Miss Brasil 2010 and world wide winner of Miss Multiverse in 2013. Lyra was born in Vila Velha, but spent two years living in the town of Divinopolis. She was a model since age 8 and had wanted to be Miss Brasil since age 12. She has participated in pageants at various countries such as Germany, France, Italy, Spain, Belarus, Czech Republic, United States (where she stayed for three months) and Bahamas. In 2013 Lyra represented Brazil at the world finals of the Miss Multiverse pageant in the Dominican Republic, she won and became the 4th Miss Multiverse winner. Winners Miss Mutiverse Beauty queens go on an epic adventure to defy danger at the world’s highest water fall at the Venezuelan Amazon. With (1,000 m), Angels falls, incomparable to any waterfall anywhere in the world has been declared world heritage. These beautiful models experience a tour with helicopter adventures, spectacular landscapes, adrenaline rush as they walk behind dangerous waterfalls with strong waters during a thundery weathered day. The adventures continue with amazing days with the turquoise waters and white sand beaches of Los Roques.